In 2012, Square Enix Japan published a trio of Final Fantasy 25th Memorial Ultimania books collecting art, developer commentary and background information on the first 14 numbered Final Fantasy games. Now Dark Horse is publishing the books in English, with the first 336 page volume arriving in July. We got samples. Wanna see? Square Enix and Studio BentStuff have been putting out Ultimania series companion books in Japan for nearly two decades. A whopping 72 books have been published in Japan since 1999, most of them covering the Final Fantasy series and its offshoots. 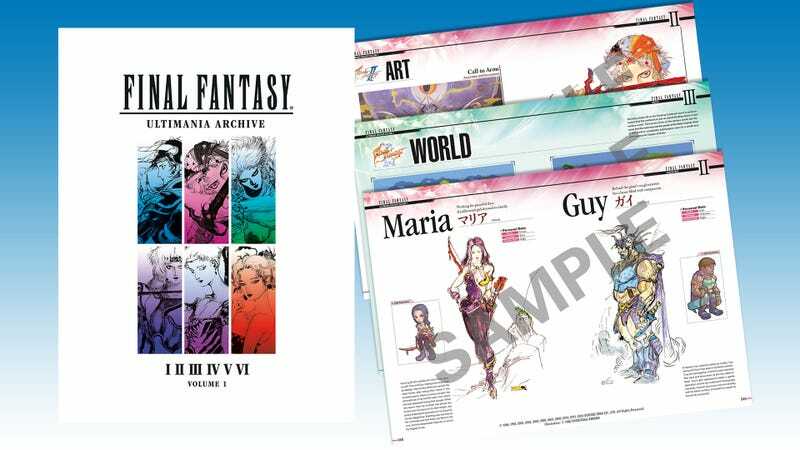 While most Ultimania books cover a single game, the Final Fantasy 25th Memorial Ultimania series is a special three volume set that goes from Final Fantasy I to XIV. One day they’ll make a Final Fantasy game that looks like living Amano art. Again, one day they will make a Final Fantasy that looks like living Amano art. One day they will make a world map that looks like living Amano art. It will be very weird. Volume two (covering Final Fantasy VII, VIII and the best one) and three (covering X through XIV) will follow after. I’d say soon after, but Dark Horse likes to draw these things out.